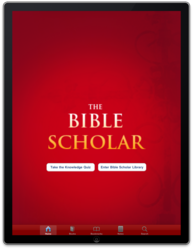 The Bible Scholar announced today that it has introduced ‘The Bible Scholar Interactive’ App for iPad, making it easier for all Christians with busy schedules to finally have access to a vast library of scholarly tools without going to a Bible College. 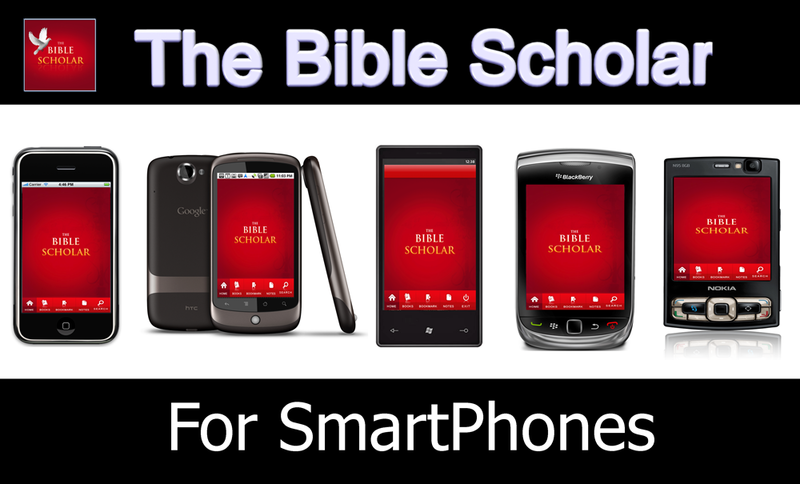 In addition to the iPad, the Bible Scholar app is also supported by the following devices: iPhone,Android (smartphones and tablets), BlackBerry, Windows Phone (Mango), and Symbian (Nokia). The Bible Scholar Interactive App for iPad is the first and only app for the iPad and all major smartphones that successfully provides an in depth account of the Church’s origin by shedding light on the age of the Apostles, Medieval Christianity, Christianity in the Middle Ages, and explores the German and Swiss reformations. 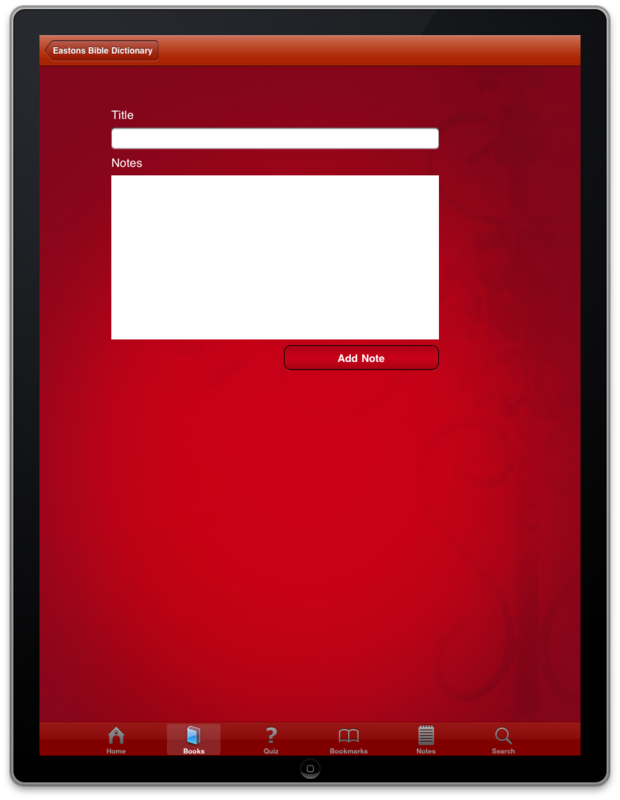 Now any serious student of the Bible can access this information with a simple tap on his or her iPad or smartphone. Considering the wealth of information in this app, it is amazing to know that this iPad app is available on the iTunes App Store for just $3.99. Additionally, ‘The Bible Scholar Interactive App’ for iPad has a Bible, a quiz with hundreds of questions, two Bible dictionaries, one topical Bible by Nave’s, seven separate Bible commentaries, The Institutes of the Christian Religion by John Calvin, eight volumes of Church history, and much more. This app contains more than 14,000 pages of Bible study gems. The Bible Scholar was also named one of "40 Awesome Android Apps for Scripture Study" by Masters in Divinity—an online site that focuses on promoting advanced degrees for pastors and professional ministry. The Android version for smartphones and tablets (which is split into two sets) is available on the Android Market and Amazon Appstore for Android (Kindle Fire). Talking about the Android version, one Dr. Nathan wrote: "Fantastic volume of information. It's equal to 20 volumes of history and contemporary learning that's sure to provide hours of interesting research sufficient to form an apologetic learning foundation. A Great find. Price these apart and $200 would be a bargain." Users of this app can copy and paste the content into emails and transfer to a desktop or laptop and incorporate it into study notes, sermons, articles, research papers or just to share with a friend. 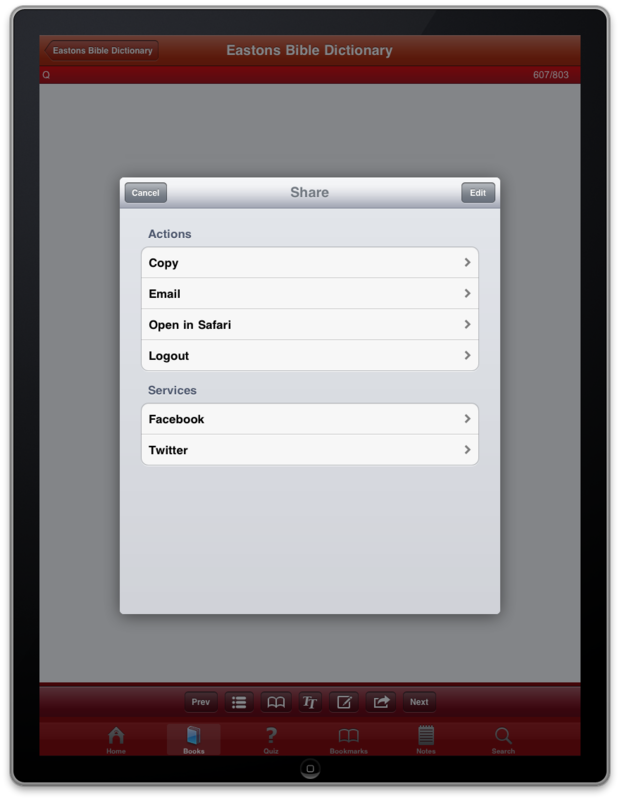 Users can also use the share feature to post to Facebook or Twitter. The Bible Scholar Interactive App for iPad is a scholar's gold mine. The new Windows Mango version of The Bible Scholar app has all the amazing new features that this new platform offers. 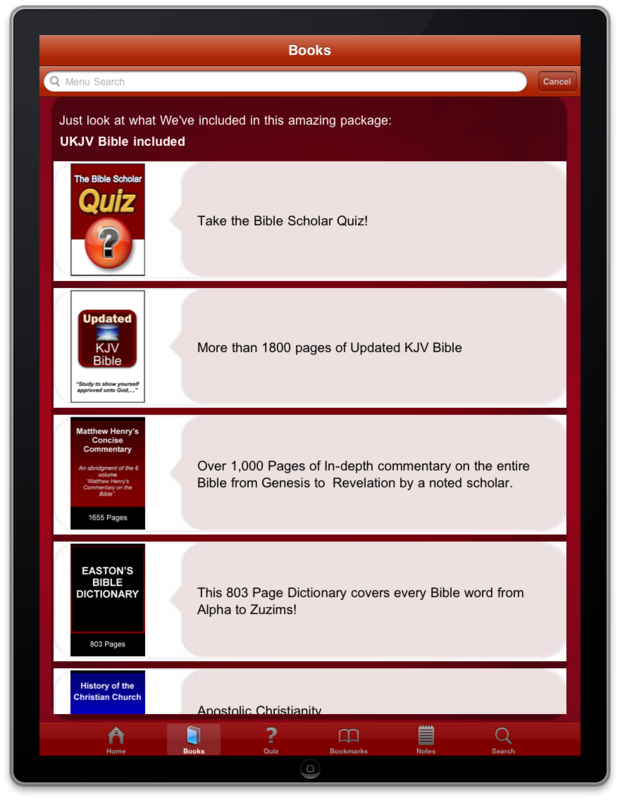 In this premier value rich Bible-based iPad App, the developers have included more than 20 volumes (with more than 14,000 Pages) of wonderful Bible study tools that answer all the questions a person could have about the Holy Scriptures. Charisma News (founded by Steve Strang), recently reported a study conducted by LifeWay that surveyed 2,000 Bible readers. The article concludes that respondents overwhelmingly prefer a Bible translation that is simpler to understand. The Updated KJV Bible is the King James Bible without the antiquated words as a way to appeal to a modern generation. Yet, this version retains the poetic flow of the King James Version that has endeared many to this most beloved Bible version. Scriptures through innovative tools, Bible commentaries, Bible dictionaries, and Church history; thus providing a firm foundation that will stand the test of time. Vision for Maximum Impact, LLC. Bible Scholar for SmartPhonesiPhone, Android, Windows Phone 7, BlackBerry, & Symbian Attractive Table of Contents Example of a passage showing 'Go To' feature available with the next update.Study Church History, Bible Commentaries, the Updated King Jame Bible and much more. 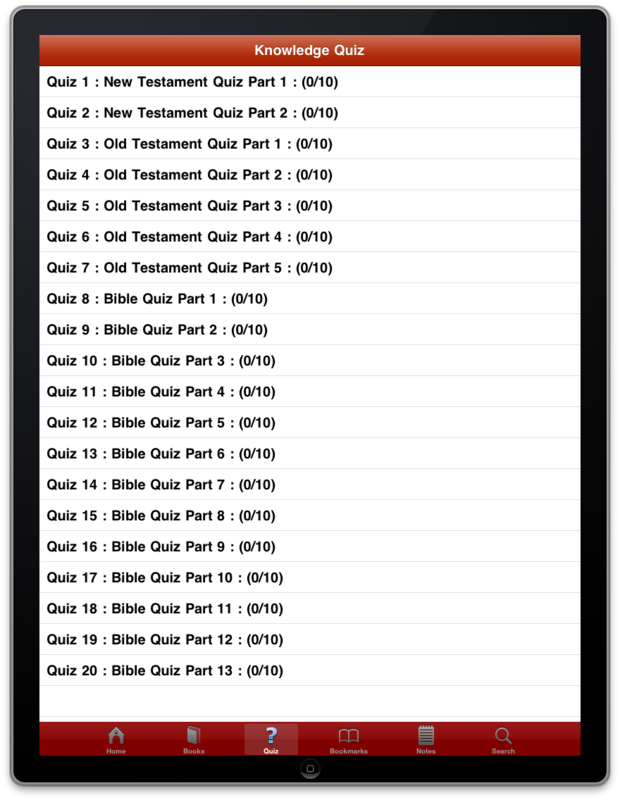 Bible Scholar QuizTake test, get score, try hundreds of Questions Sharing FeaturesShare to Facebook, Twitter, or Email from the Bible Scholar Interactive Interactive Bible Quiz Takes Notes and Bookmark Pages Quiz SelectionsSelect a quiz and test your knowledge using The Bible Scholar Quiz for iPad Updated KJV BibleUpdated King James Bible Great legible reading pane for the UKJV Bible.Great addition to apps such as Youversion, Olive Tree Amplified Bible BibleReader, Bible.is, Daily Bible NIV, Catholic One, Strong's concordance, Bible Quotes, NIV Tecarta, AcroBible, CadreBible, MySword, ESV, Virtue Bible FE, The Hope Machine, BfA Bible Study, Bible Discovery, Touch Bible, Bible Summary, And Bible, Words of Jesus Daily Bible, Quick King James, Bible Verses Live, Logos Bible Software, Easton, Nave's.